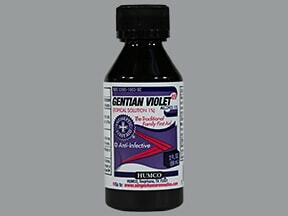 Gentian violet is an antiseptic dye used to treat fungal infections of the skin (e.g., ringworm, athlete's foot). It also has weak antibacterial effects and may be used on minor cuts and scrapes to prevent infection. Before use, clean the affected area, rinse well, and pat dry. Make sure the area is dry before using this medication. Using a cotton swab to avoid staining your hands, apply gentian violet to the affected area, usually once or twice a day or as directed by your doctor. Apply only to the affected area, and avoid surrounding healthy skin. Wash hands immediately after use unless the area being treated includes the hands. Avoid getting the product in your eyes. If the medication gets into your eyes, rinse the area immediately with clean water for at least 15 minutes. Seek medical attention if your eye becomes irritated. Do not cover the area with plastic or waterproof bandages. Covering the area may increase the risk of skin irritation. This product is for use on the outside of the body only. Do not apply inside the mouth, nose, or ears unless directed by your doctor. This medication is a dye and will stain skin and clothing. Do not apply to open sores (skin ulcers). This may cause permanent "tattooing" of the skin. If your doctor has prescribed this medication for areas in the mouth, you/your child must be careful to avoid swallowing the medication. If you have any questions about proper use, ask your health care professional. Use this medication regularly in order to get the most benefit from it. To help you remember, use it at the same time(s) each day. If your doctor has prescribed this medication, continue to use it until the full prescribed amount is finished, even if symptoms improve after a few days. Stopping the medication too early may allow the infection to return. Inform your doctor if the condition does not improve in 3 days or if it worsens. If you think there may be a serious medical problem, seek immediate medical attention. What conditions does Gentian Violet Solution, Non- treat? Redness, swelling, or irritation at the application site may occur. If any of these effects persist or worsen, contact your doctor or pharmacist promptly. Stop using this medication and tell your doctor if you have new signs of a skin infection (heat, tenderness, pus). Stop using this medication and tell your doctor right away if this rare but serious side effect occurs: skin sores. Skin sores are more likely to develop when the medication is applied to skin folds (e.g., between the toes, beneath the breasts). Be careful to apply only a small amount to skin fold areas, and allow to dry completely before putting on shoes or clothing. Before using gentian violet, tell your doctor or pharmacist if you are allergic to it; or to other dyes; or if you have any other allergies. This product may contain inactive ingredients, which can cause allergic reactions or other problems. Talk to your pharmacist for more details. If you have a certain metabolic disease (porphyria), consult your doctor or pharmacist before using this product. It is unlikely that this product passes into breast milk. Consult your doctor before breast-feeding. What should I know regarding pregnancy, nursing and administering Gentian Violet Solution, Non- to children or the elderly? If you are using this medication under your doctor's direction, your doctor or pharmacist may already be aware of any possible drug interactions and may be monitoring you for them. Do not start, stop, or change the dosage of any medicine before checking with your doctor or pharmacist first. This medicine may be harmful if swallowed. If someone has overdosed and has serious symptoms such as passing out or trouble breathing, call 911. Otherwise, call a poison control center right away. US residents can call their local poison control center at 1-800-222-1222. Canada residents can call a provincial poison control center. Symptoms of overdose may include: nausea, vomiting, diarrhea. Have you ever purchased Gentian Violet Solution, Non-?